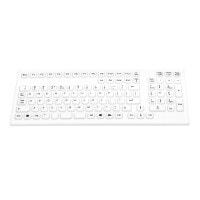 Medical keyboards are conceived for unhindered use in surgeries and hospitals. 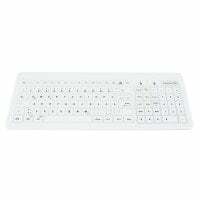 To assure suitability for these areas, medical keyboards can be cleaned and disinfected. 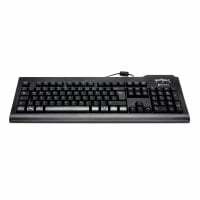 In our online shop, you will find the proper keyboards for your needs. 199,90 EUR* Not ready for shipping. Reserve today and we will ship as soon as possible. 79,50 EUR* Not ready for shipping. Reserve today and we will ship as soon as possible. 320,00 EUR* Not ready for shipping. Reserve today and we will ship as soon as possible. 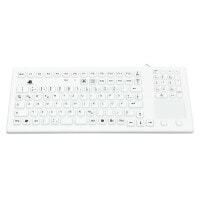 A medical keyboard is a computer keyboard that is specially designed for the particular requirements of healthcare. In this case, it is vital that no germs are transmitted from one employee to the next by way of the keyboard. Therefore, it is important that medical keyboards are resistant to liquids so that they can be cleaned and treated with disinfectants. Unlike common keyboards, medical keyboards that can handle disinfectants are only supplied by specialised manufacturers like GETT. 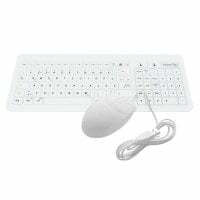 In this category, we offer you a wide range of medical keyboards and mouses from GETT for use in surgeries, hospitals and other healthcare facilities. These peripheral devices are typically connected by USB, although some input devices offer an additional PS/2 port that is compatible with older computers. Depending on the model and manufacturer, some medical keyboards also have a built in trackpad that makes an additional mouse superfluous. 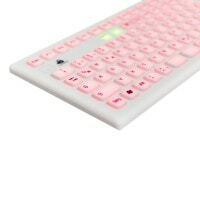 A silicone keyboard is a computer keyboard that usually has a fully enclosed silicone surface. 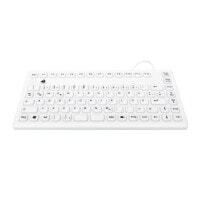 Usually, a silicone medical keyboard offers the safety class IP 68, meaning it is completely impervious to dust and liquids. Therefore, it is no problem to clean or disinfect the keyboard in an immersion bath. Silicone keyboards are useful in particularly hygienically-critical areas, such as intensive care stations or in the operating theatre, as the design and preparation possibilities assures that they will not collect germs under the keys or in difficult to reach points. Of course, all of the silicone medical keyboards available in our shop are not only waterproof, but they also tolerate all common disinfectants and are, therefore, ideal for use in the surgery and hygienically sensitive areas of hospitals. Glass keyboards are also excellent as an hygienic accessory to your surgery PC, since the topside of the keys is very easy to clean and disinfect. Unlike silicone medical keyboards, however, the topside is often the only waterproof section and it is not possible to immerse the keyboard in liquids; the backside should be kept away from moisture. 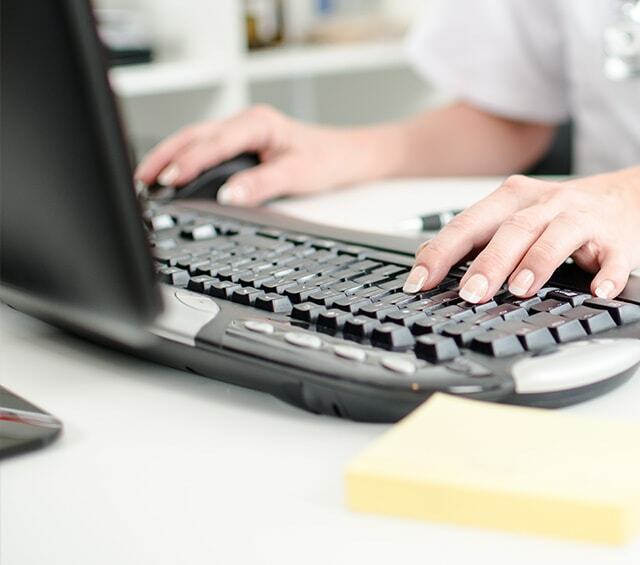 An illuminated keyboard is always helpful for examinations or treatments that take place in a darkened room, as immediate documentation of the situation is often necessary. The illuminated keys allow one to easily type in the results of the exam without affecting the situation, even in dim or dark rooms. Many illuminated keyboards are specially equipped with brightness regulation for this exact purpose. Typical examples for where an illuminated keyboard would come into use are ultrasound rooms or optometry offices. These keyboards are powered by a USB connection to the computer. Just like a keyboard, a computer mouse can be a breeding ground for pathogens. Therefore, it is especially important to use a mouse that can be cleaned and disinfected. 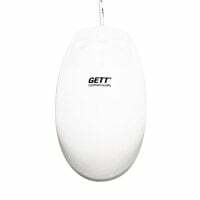 In this category, we offer you medical mouses from GETT that are suited for hygienically sensitive areas, such as intensive care units. The medical mouses are not completely waterproof, but are equipped with an antimicrobial additive that prevents germ propagation on the surface of the mouse. Praxisdienst offers you the proper disinfectable medical keyboards with a USB or PS/2 port for any requirement. 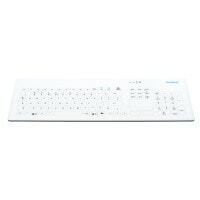 Whether you are looking for a silicone keyboard for the operating theatre, a glass keyboard for the reception area or an illuminated keyboard for ultrasound rooms, you are sure to find the right keyboard for your needs. Of course, you can also order medical mouses from us that are specially designed for use in healthcare. The mouses are an optimal supplement to the medical keyboards that are characterised by user comfort and fulfil the rigorous hygiene requirements. 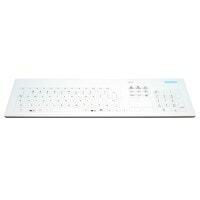 Do you have questions about a medical keyboard or need a product that you cannot find in our online shop? Just talk to us–our customer service is happy to advise you. You can reach us by email, chat or telephone.